We have completed a number of international education market research projects for a wide-range of clients. 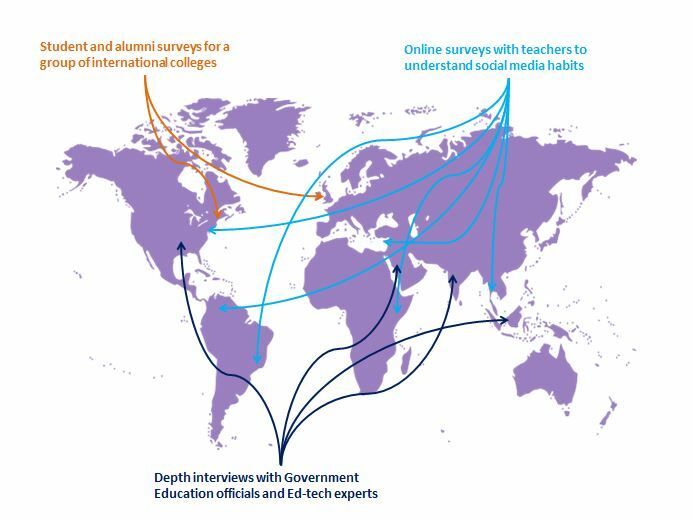 These have varied from studies to measure and understand the social media habits of teachers from countries covering all of the world’s continents, to student and alumni surveys for a well-known international group of colleges and schools, to how foreign speaking students react to a new form of English language proficiency test. Our experience of carrying out international education market research covers a wide-range of methodologies, including both online and offline approaches. We can conduct both qualitative and quantitative studies, including for instance online focus groups or face to face depth interviews; online, telephone or face to face surveys and also desk research and literature reviews. Many international research projects focus on new product development, or launching an existing product or service in a different country or global region. This is an area we have vast experience in, and in which our internal resources can play a significant role in ensuring high quality research is delivered at a cost-effective and competitive price. We have our own international telephone market research unit in-house, as well as internal scripting and data processing teams to allow for online interviewing and robust statistical analysis. Our team has experience of interviewing senior level and hard to reach respondents from across the world – including education department representatives from a range of countries, ed-tech experts, school system directors, UN representatives and teachers and principals from primary, secondary and tertiary education institutions in the Americas, Africa, Asia, Australasia and Europe. In addition to our international education market research expertise, we also have experience in conducting research with non-British nationals living, working and studying in the UK. These include, for instance, beginner and intermediate level students looking to take English-language tests, and foreign students studying accredited courses at UK Universities.